The Queen and The Duke of Edinburgh will visit Greenwich today to reopen Cutty Sark after six years of painstaking restoration. In an unprecedented feat of engineering, the last surviving tea clipper has been raised 11ft into the air, thus relieving pressure on her keel and offering visitors a view of her sweeping lines from below. Above decks, 11 miles of rigging support the three masts, and the surrounding exhibition space includes more than 80 ship’s figureheads. Launched in 1869, Cutty Sark made her name as the fastest ship to carry wool to Australia. Capable of reaching the record-breaking speed of 17½ knots (20mph), she once famously overhauled the great P&O steam ship Britannia, which was travelling at a mere 15 knots. 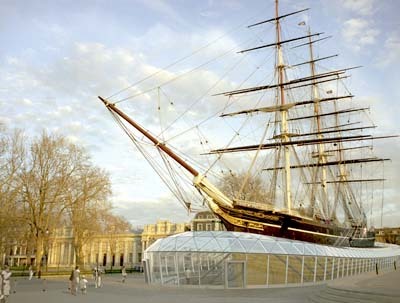 In 1895, Cutty Sark was sold to a Portuguese owner, and was then saved and restored in 1922 by Wilfred Dowman, a retired windjammer skipper. She became a training ship, and finally part of the 1951 Festival of Britain. Afterwards, the scrapyard threatened, but she was saved for display in dry dock at Greenwich by the Cutty Sark Society in 1954, with the help of The Duke of Edinburgh.